Specifically, I’m referring to “Homemade Macaroni and Cheese” Recipes. This is the 3rd recipe I’ve shared in the recent past and I just can’t get enough of the creamy, delicious goodness. This time, I decided to ‘lace’ the bread crumbs with teeny bits of bacon. Because, BACON. Cook bacon in skillet. Then make cheese sauce in same skillet. Then combine pasta and cheese sauce. 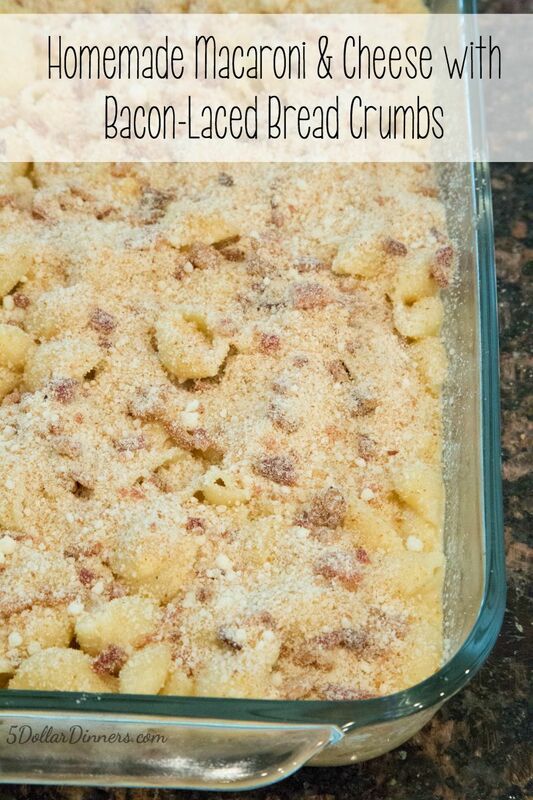 The make ‘bacon-laced’ bread crumbs. Assemble and bake until bubbly. Preheat oven to 375. Lightly spray a 9×13-inch glass baking dish with non-stick cooking spray. Boil the pasta as directed. Drain well. In a large skillet, cook the bacon until crispy. Set aside to drain. Chop into tiny pieces and set aside. Pour off a little of the bacon grease, but you want 2-3 Tbsp to stay in the skillet. Add the flour to the skillet and whisk with the bacon grease. Quickly pour in the milk, whisking well to prevent lumping. Once incorporated, add in the cream cheese cubes, stirring constantly until it melts into the sauce. Bring the sauce to bubbling. 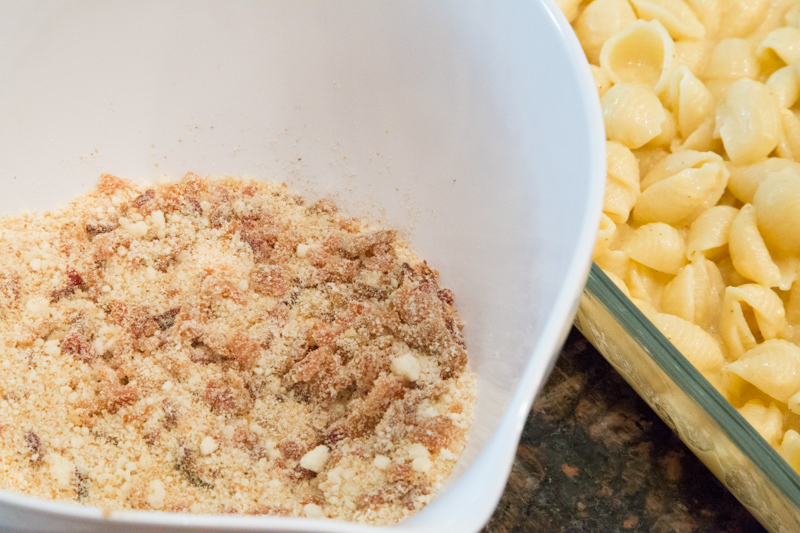 In a small bowl, mix together the bread crumbs, Parmesan cheese and chopped bacon. Pour the pasta into the baking dish, then pour the cheesy sauce over the top. Gently combine and mix together. Add the 2 cups of shredded cheese on top, then add the bacon-laced bread crumbs to the very top. Bake in the preheated oven for 15 to 20 minutes, or until cheese has melted. 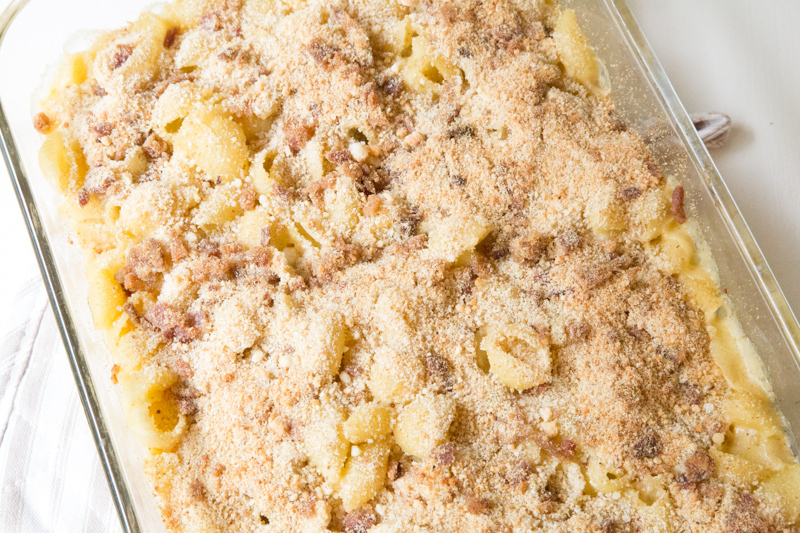 Serve Macaroni and Cheese with Bacon-Laced Bread Crumbs with some fruit and veggies. I’m really excited to try this! I have started following your blog. I’m trying to make cheaper dinners since we have such a large family. This doesn’t look hard to make. The directions say to “chop chop chop” the past. Did you mean chip the bacon or do you really chop up the pasta? Love your site! Oops – that should be the bacon! I’ll fix the post. Thanks! Do you add the 2 cups of shredded cheese in with the cubed up cream cheese?